Guide for the hero Thane, a character in Arena of Valor (AoV). Included are Thane’s abilities, statistics, attributes, strengths, weaknesses, and more. 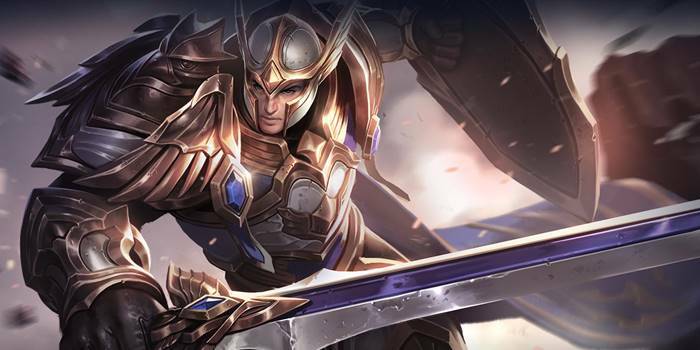 These are Thane’s attributes on the mobile version of Arena of Valor. Click here for his attributes on the Nintendo Switch version. When Thane’s HP falls below 30%, he regenerates 24% of his maximum HP over 4 seconds. Also grants 25% damage reduction while active. 75-second cooldown. Thane charges forward, knocking enemies back and dealing 60/75/90/105/120/135 (+0.35 AD)ˀ physical damage each hit. Valiant Charge’s final hit will also knock enemies into the air. Thane strikes the ground, dealing 200/260/320/380/440/500 (+0.58 AD) physical damage to enemies within range. He also knocks enemies into the air and slows their movement speed by 90% for 2 seconds. Has a delay of roughly 80 milliseconds before stunning an enemy. Thane charges for a short time, then unleashes a powerful blow in frontal cone, dealing 500/750/1000 (+0.9 AD) true damage to enemies in the area. The blow also deals 15% of the targets’ lost HP as physical damage. Thane gains 20% damage reduction and cannot be interrupted while charging this ability. Thane charges for about 1 second before hitting an enemy. Thane cannot be stopped once he starts his Valiant Charge, so use this to your advantage. King’s Glory has a slight delay and not a very long range. It is best to unleash this ability when enemies are close. Our recommended order for Thane’s abilities as he levels up.